In the last two weeks, I've had two different people spoil the end of the same book for me. A lot of people I know would be livid about someoneone telling them the ending of a book they've been anticipating since mentions of it first started flying around the internet. I can't blame you if you think this is weird. Most of my friends feel the same way. They do their best to dance around spoilers in an effort not to tip me off about how a book or movie turns out. They do it do it because they can't get past it once they hear a spoiler. 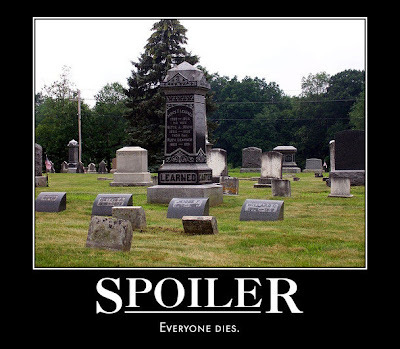 Hearing spoilers makes them delay reading or watching or possibly skip the book or movie all together. SJ: Suse, I'm sorry I accidentally spoiled the ending of Wither for you. If I were you, I'd kill me. WPP: Eh. Spoilers don't really bother me. SJ: Seriously? How can they not bother you. I'm still gunning for the idiot on one of my email loops who spoiled the last Harry Dresden book for me. Haven't even had the heart to read the book. Why do spoilers not bother you? WPP: Most people get angry because they find out the end of the book. To a lot of readers, that's what it's about -- The endgame. For me, it's more about how it came to that. In other words, it's the journey, not the destination. SJ: But sometimes, knowing the endgame can also spoil the journey. For example, by knowing what happens at the end of Wither, doesn't it ruin the tension that builds up over the course of the book? WPP: Not in the least. How can I explain it... Okay, so you and I are in a boat and we hear the rushing of a waterfall growing louder and we know we're going over. Does the fact that we know we're about to fall screaming to what could be our watery deaths mean that we aren't going to freak out about it? SJ: No, but if I already know we're going to die it sort of takes the tension out of it. And if I know a flying pink unicorn is going to swoop out of the sky and rescue us just as the boat goes over, that REALLY takes the tension out of it. (Although the appearance of the flying pink unicorn might be kinda dramatic.) I'd miss that thrill of "OMG, (author) is going to actually let us DIE." WPP: I get that. I guess it's real a psychological question. If someone tells you something about a book or any kind of plot really, do you let it get in your way when you read it or do you shove it off as a passing conversation and just read? Pure immersion in the book. You find out that Old Yeller dies in the end. Is it suddenly less emotional because he's already a dead dog? SJ: LOL. Yes, I refuse to watch it now because I know it will make me weep. But I see your point. I guess there aren't that many books into which I can get that deeply immersed. I do re-read favorites and enjoy...hey, wait...you have me arguing for your side now! You are a sneaky, evil woman. WPP: Exactly! (Not me being an evil woman. Well, maybe...) It's just like rereading. You already know what's going to happen, but that doesn't mean it can't still evoke emotion and create tension. It's all about letting yourself sink into it. If you can just let go of the fact that you already "know" that something is going to happen then it won't ruin the book for you. It's mental trickery! SJ: It takes a special book, or a book that you especially bond with, to achieve that, however. For me, anyway. And I'll go back to the Dresden book. I love this series--it's one of my favorites, in fact. But knowing what happens in that book, because it's such a drastic, earth-shattering thing, really has ruined it for me. I'll read the book, waiting for "it" to happen.The journey will lose something. WPP: It's an authors job to build tension, make you feel emotion and take the reader off guard. That means that plots have to be intricate. Think about it likea mystery or a game of clue. Don't you want to know how it happened and why? Col. Mustard in the Conservatory with the wrench! Besides, the best part of that movie is Tim Curry's explanations of HOW it happened. SJ: Bah. I hated that movie. SJ: But, again, I see your point. SJ: You're welcome. See, aren't we civilized? WPP: I think that's purely because I've swayed you. SJ: That while knowing how a book ends will not necessarily RUIN a book for you, will you concede that given a choice, you would rather not have some idiot crit partner telling you the ending anyway? WPP: Yes. I definitely prefer not to know. All I mean is that I can get by even when I do know. (Does anyone else think I've overthought this?) I have so many friends who get excited about reading and spill their guts that if I believed that a little spoilery ruined books then I would never read a single one! SJ: LOL. Or never talk to anyone. WPP: Right. I'll just become a recluse. That's much easier than reading the book in spite of the spoilery. SJ: I think we've reached a consensus. You've conceded that no, you'd rather not know spoilers, and I have conceded that no, knowing the ending does not necessarily ruin the journey. SJ: Now....want to know how Shift ends? I'd love to hear your thoughts on spoilers. Does hearing anything spoilery ruin a book or movie for you? Can you just ignore it and move on? What lengths will you go to in order to avoid them? Let me know! Spoilers ruin stories for me to a point. Like when my mother in law told me the end of Book of Eli before I saw the movie. I watched it and still enjoyed it, but I didn't get to enjoy it in the way I would have if I didn't already know what was going to happen. Or a certain trilogy I was planning on reading was spoiled because someone didn't put that there were spoilers in their review. They totally blew the ending for everyone who read that review. Re-reading something is totally different for me. Even though I read it already I chose to re-read it. You get a different experience the second time, catch things you didn't catch the first. But if it's spoiled you don't get that chance. If someone asks if they can tell me what happens and I give the okay, then by all means, tell me. But it should always be an option. And depending on how invested I am in the story I will go to great lengths not to have it spoiled. Like the vampire academy series. I still have two books left so I am trying my hardest to stay away from anything VA related so I don't know how the last one ends. It depends on how big the spoiler is and how much I love the book/series. the bigger the spoiler the more likely it'll ruin the book for me but I don't think a spoiler has ever completely ruined a book for me. There is only one spoiler that sticks out in my head for me and its one from HP and Prisoner of Azkaban I was spoiled twice, one by a friend and one by someone who was just talking to a friend of his while walking right past me. I was not happy with either spoil and it did ruin a big reveal in the book but there was also another big reveal that I had not seen coming and its my favourite book out of the series so even those spoilers hadn't ruin the book for me. I'd still rather not get spoiled and I can become quite evil if someone spoils me intentionally. If they spoil me accidentally then I'll just get sad u_u. Now to me it's certainly not about the ending like you it's more about the journey but I would still feel deeply cheated if someone just blurted out the ending to me it's weird I don't know that I can accurately describe how I feel when that happens..
Spoilers don't bother me either. In fact, I usually look for them in some cases, lol. Or I don't think of them as spoilers- like I mentioned Jane Lynch was going to sing Vogue in an episode of Glee and my roommate freaked out because she considered it a spoiler; she's definitely like Suzanne when it comes to spoilers, lol. For me though, spoilers don't bother me because I have a TERRIBLE memory. I'm likely to forget all about it within a day, if not less. Even when I get to the book, it'll seem brand new to me, or I'll remember after the fact. If it was a current read, I still wouldn't mind because depending on how exciting the spoiler is, it may keep me reading the book to see how the author gets to that point. For me, it is about the journey rather than the end result. I mean, think about romances, either in books or movies. You start one and know shortly after starting who the romantic lead is and that they'll end up together. It doesn't bother people then so why should it bother somebody in any other type of genre? I HATE spoilers. I'll never forget reading Anna Karenina for the first time and the introduction told me what happened to Anna at the end... just ruined it for me. And if I'd known the big twist for a film like Fight Club it would've so ruined it for me. Do I enjoy rewatching Fight Club and working out all the clues after I know what's really going on? Yes. But it's a completely different thing to watching it for the first time and the shock of realising what the twist was.